There are ads all over the internet of dogs for sale and newborn puppies for sale, however, pet parents often overlook adopting a four-legged family member from an animal shelter or rescue group when exploring how to search for dogs and puppies for sale. Whether you’re looking for little puppies, breeds of miniature puppies, or older dogs, you’ll likely find the breed and size of pup you’re interested in amongst the 130,000 adoptable dogs and puppies at your fingertips, around the country, in Canada and Mexico with a search on Petfinder. To find an adoptions near you, start a search for dogs and puppies. Adoption fees play an important role in caring for an adopted pup, as well as help support the shelter or rescue organization’s mission, and can range between being waived, to a few hundred dollars; dogs and puppies for sale, can run into the thousands. Shelter and rescue groups may waive an adoption fee, or require a minimal adoption fee to help cover the expenses of sheltering and caring for the pets in their organization. Many of the dogs and puppies at adoption organizations may have received age-appropriate vaccinations and a veterinarian check, been spayed or neutered, and microchipped prior to leaving with new pet parents. These necessary services are also covered in an adoption fee, ensuring your family gets a happy, healthy pup. You may already have a specific breed of dog or puppy in mind before you begin searching for your next best friend. Not all dogs and families are a good match, and there are many factors that need to be considered before making a decision. Of course, the best way to know for sure that you have found your perfect match is to visit any potential dog candidates in-person. Consider some of these questions to ask yourself before adopting a dog. What size dog would best match a family with children? How do I match a dog’s energy level to my lifestyle? Which type of temperament works best with my personality? Which dogs have high and low grooming and maintenance needs? Your next best friend’s happy tail starts now. Search Petfinder.com and adopt a pup, and see how the benefits of adoption far outweigh a search for dogs and puppies for sale. 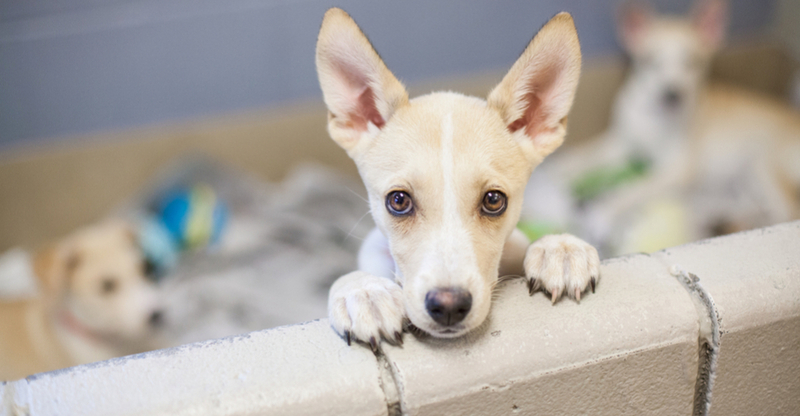 To find adoptable pups near you, start a search for dogs and puppies.